“I’m sorry. There’s no explanation for why this is happening,” she apologized, pointing to only half of a heart beating proudly through the 18-week ultrasound scan. “I’m sorry. There’s no explanation for why this is happening,” he sympathized, instructing us to pack our bags for a month-long readmission due to heart failure. So today Annie conquered her stage two open heart surgery in a mere two hours. Everything went exactly as planned. The surgeon did not have to stop her heart to perform the procedure. He was able to easily and flawlessly make the new connections to reroute her blood flow. He closed her chest during the procedure. 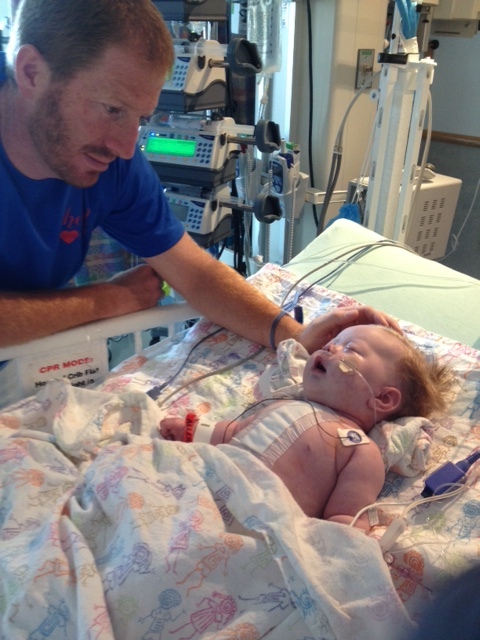 She came out of the operating room extubated (breathing fully on her own). And he even told us that he saw no problem with her ventricular function while he worked on her heart today. Finally, after another hour of waiting, we got to see this baby who no one can explain! She is pinker than ever! Her sats rest at 84! Four hours after surgery our chunky muffin was begging to eat. She guzzled down 2 ounces of pedialyte to prove she was ready for real food. Tonight she ate 5 ounces of her regular formula in an hour and is sucking away on her thumb begging for a refill. She’s off her sedation meds. Down on her morphine dosage…and wondering why she has to sit up to be burped. We are well on our way to having our Annie back. There may not be a medical explanation. But I have a pretty good feeling that the Great Physician has been gently, lovingly massaging Annie’s little half heart. He’s been whispering healing through his soft, careful hands. Thank you to so many friends and family who have flooded us with prayers, love, and support today. We could not even begin to think of walking this journey without y’all. Thank you for wanting a front row seat to our huge God loving on a tiny heart. Even heart warriors need to look pretty! And this heart warrior doesn’t want Mommy to leave for the night. Heart-printed legwarmers. Pink, snap-up pajamas. Hayden’s heart blanket. Essential Oils diffuser. A big bottle of thieves. And ziiiip we pack Annie’s hospital bag. And ziiip we pack away summer with our girls. I wanted a different summer. I’m not ready to go. But Saturday morning we will leave dark and early on our 20-hour trip to Philadelphia. If only one minute of these next 36 hours could pass as achingly. eternally. turtlesquely. painstakingly. slowly. The same way our recent inpatient moments sauntered by. Instead I know they’ll pass in a nascar exhaust haze and all too soon we’ll be blubbering goodbye to Audrey’s morning breath in the Saturday dawn. 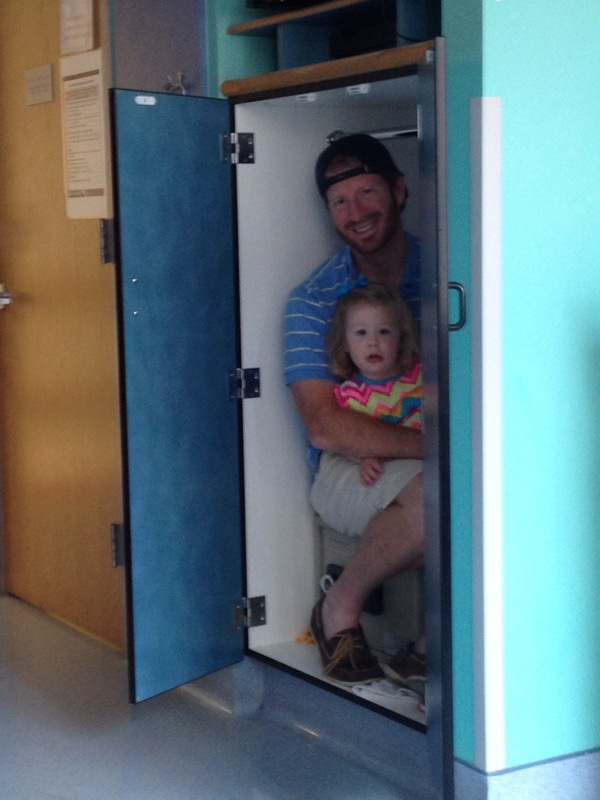 We are excited to hear, though, that Annie is as ready as she’ll ever be for her next open heart procedure. Our Little Rock cardiologist was a little skeptical because she has a cold right now that has required her to be on oxygen most of the week at home. He was prepared to convince us that we might consider rescheduling when Annie’s heart echo convinced him otherwise. He was excited to report that her echo showed continued improvement in her heart function. 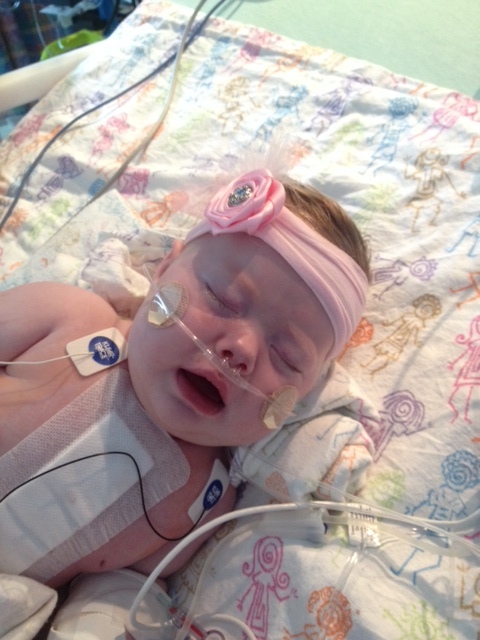 Her heart is recovering on its own…a heart that we seriously considered “discarding” for a new one only weeks ago. And for further proof, her heart failure numbers have decreased from 10,000 (when we were required to be admitted June 6), to 2,900 two weeks ago, to 2,300 this week. While all of these sound promising, my mind is haunted knowing that there remains more than a small chance that when we give our smiling, engaging, holding-on-tight-to-snuggle baby over we could get back a cold, lifeless memory. I mentioned this to a friend who called to pray with me this week. She reminded me of a well-known story with even gloomier odds. A 9-ft tall professional murderer, who had his own shield bearer assistant, taunted an enemy army. In skipped a shepherd, delivering lunch to his trembling brothers. David, “only a boy handsome and ruddy,” wanted to try his hand at battle. Everyone laughed and scoffed at him. A little boy who cuddled sheep all day had no business fighting a giant. So my prayer for the next week is that I’ll remember it’s not by scalpel or incision or favorable odds that the Lord works, because the battle is His. And whatever He has for Annie’s life and our future is the right thing. In 14 days Dr. Montenegro will kidnap Annie and coax her into a still, painless sleep. For 4 long hours we will try desperately to believe her famous pre-procedure words, “Don’t worry. We’ll take good care of her.” While Annie rests limp and nearly lifeless, Dr. Spray will again open her chest and touch her heart with his practiced hands. I hope her heart remembers his familiar, lifesaving touch. The problem is that because of her heart failure that caused our recent 30-day hospital stay it won’t be as easy this time. In 2/3 of patients like Annie who already exhibit some level of dysfunction, the Glenn procedure will improve the work of their hearts. 1/3 of the patients, though, have hearts that are already too weak to respond. Our cardiologist called this the 33% who do poorly…adding that poorly is a nice way of saying hopelessly. Hopelessly doesn’t mean a tough recovery or longer inpatient stay or more medicines or a bigger scar. Hopelessly, in 90something% of those 33%, means death. The odds are still in our favor. 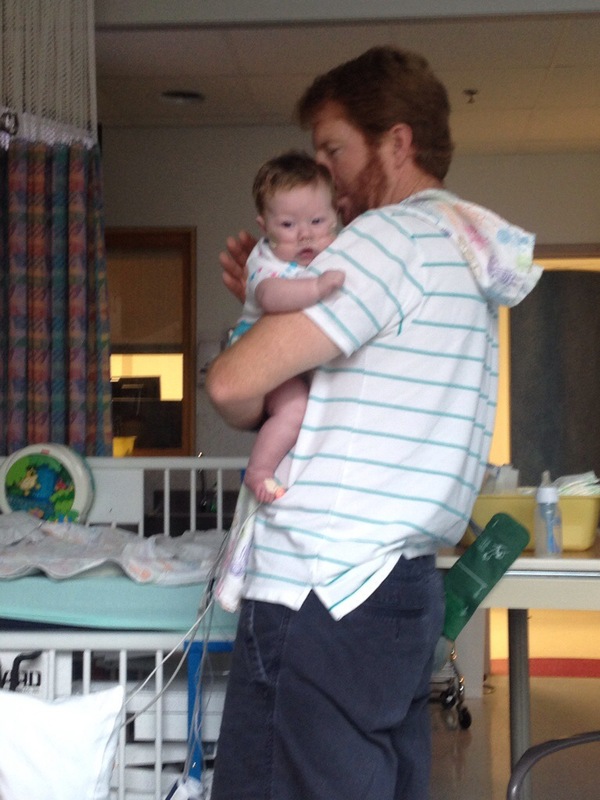 The same odds that were less than 1% (1 in 110) that Annie would have a congenital heart defect in the first place. 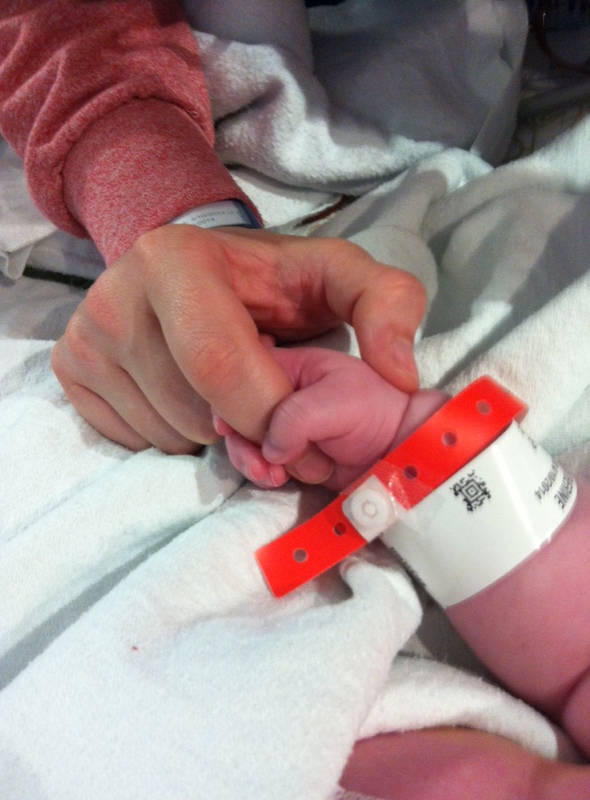 But these are also the odds that said Annie would be in the hospital up to 8 weeks after she was born. Annie stayed a mere 16 days. The same odds that said she would likely struggle to eat by mouth and definitely wouldn’t ever breastfeed. We laugh as for 12 weeks I breastfed our now 14lb 12oz roly poly who ranks in the 92% for weight out of all 3 month olds. Because of Annie’s defying of some odds and succumbing to others, she’s lived 8 weeks at home and 6 weeks institutionalized (thank you, medicaid office, for that cozy classification). So in 10 days we will load our Acadia with bottles, diapers, monogrammed onesies, Dr. Pepper (I’m not going to be missing that again! ), and all of our dreams to travel 1,172 miles to our institution of choice in hopes to arrive within 20 hours for Annie to undergo her second of three open heart surgeries. All of these numbers swirling around in my head dizzy my spirit. But then I’m reminded that there’s more. The God who knows how many individual hairs make up Annie’s voluminous ginger tuft also knows the count of every.single.one. of her little half-heart beats. And He guarantees that in eternity, numbers won’t matter anymore. So on that grim surgery day of July 30, and every day until then, I hope in Him and His promise that no matter what may come, He will be enough. God has graciously given me a tangible proof of his promise that I am never alone. He gave me Matt. A selfless, patient, toddler bathing, baby bouncing husband to share this impossible journey with. Matt loves us so well and is a surprisingly wonderful girl daddy. He gladly sips pretend tea from a dainty Minnie Mouse cup. He gently strokes blonde hair precisely into place to clip in a polka dotted bow. He oodles and awes over the beauty of Audrey’s purple “hangnail” polish, while kindly keeping silent about the odor permeating from the sweaty shoes she removed to show him. He ties ruffly bikini strings and pulls shorts into place already complaining that too much skin is bare. He proudly carries a pink and green monogrammed “A” diaper bag over one shoulder while lugging Annie’s infant carrier in the opposite hand. He comforts her new baby cry, “Shhhh, Sweets. Daddy will get you as soon as we get home.” He has sat prayerfully rocking her into wee hours, waiting for nightly doctor rounds. Most of all he has remained faithful and unwavering in clinging to a God he knows is good. Countless times he’s looked across the rising elevator and asked me, “How do people do this when they don’t trust God?” as he sighs to prepare himself for how we might find Annie when we get to the 6th floor. And he’s assured me, “I know whatever it is, God has a plan.” When I’ve felt like falling apart, he’s reminded that we can do this together: God, me, and him. What a pillar of strength and gentleness for our family to lean on for life. And because he’s such a great dad and husband, he flew home with our out-of-sorts Audrey Tuesday morning. But today he packs the car to caravan back to Philadelphia. Because me and Annie need to be picked up for home!! 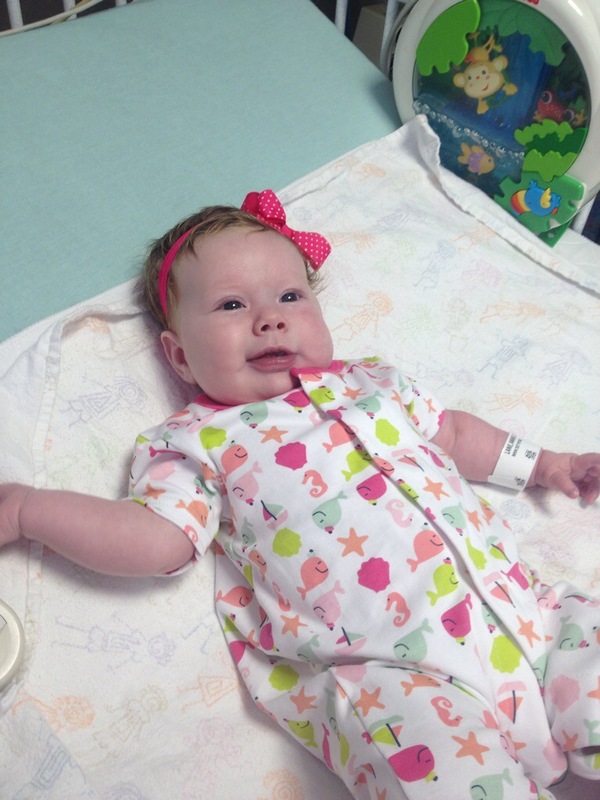 This morning’s rounds confirmed that Annie’s heart failure numbers are at an all-time low. Her heart echo showed stability in function after being off the IV. They even found that the blood clot in her leg caused by her cath has cleared. So she got her picc line removed because she doesn’t need IV access anymore! And I don’t have to learn how to administer the shots for her blood thinner. They said as soon as Matt gets here, we will be discharged for home. The only complaint I have about this sweet hubby of mine is that he usually drives too slow.